After the last crappy weekend, when I had a hard time to get my feet off the ground and hated every km of the two runs, I decided to take a few days off to recover. I guess those 3 weeks skiing and eating Swiss chocolate caught up with me. So, after 3 days of doing nothing, a great massage and only a 1-hour jog on Thursday, I was ready to join the team for the weekend training – covering two sections of the Coastrek. 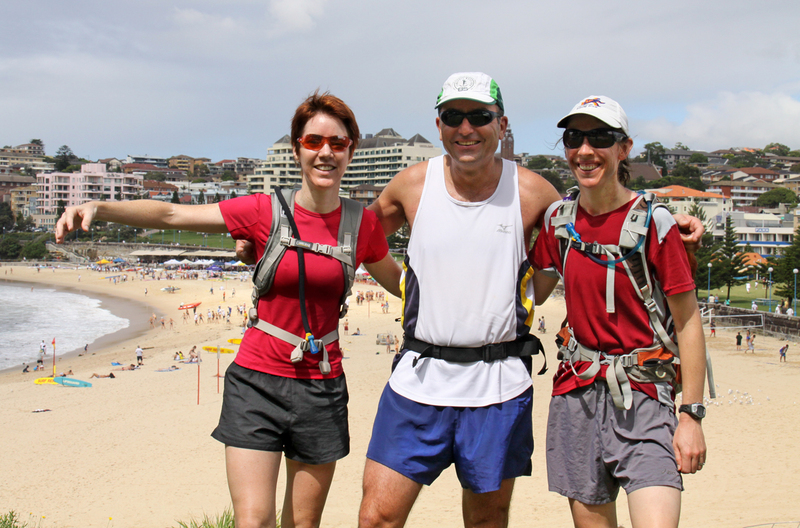 On Saturday morning I ran from Maroubra to the Opera House were I joined up with Jo, our new team member and Sam. Denis, the slacko, stayed in bed pretending to suffer from jet lag (he flew back from Perth the night before). We enjoyed a great run along the coast to Watsons Bay and then down to Coogee. The first 3 hours were blissfully cool, and only during the last 10km the sun came out – and with it the humidity. Denis tried to catch up with us, but missed us running into our direction. He called from Vaucluse when we just arrived in Bronte! After a great 5 hours run it was bliss to jump into the pool to cool down before enjoying a great breakfast with the whole team at Coogee Beach (Denis made it back in time for brekkie). On Sunday we drove to the Opera House to park the scooters and toke the ferry to Manly. Denis and I started towards the Spit Bridge and Sam and a couple of her friends ran towards us from North Sydney. Halfway we met and continued all together back to the Harbour Bridge. It started to get very hot and I felt yesterday’s long run in my legs. Sam’s friends were setting a fast pace and kept chatting casually all the way back to North Sydney. I am glad that they did not sign up for the Coastrek, as they would have left us in their wake big time. We found out later from Sam that one of them runs marathons in just over 3 hours, and the other is a champion in orienteering… no wonder I struggled to keep up with them. Now looking forward to another relaxing week before attempting the last (first) section of the trek that we’ll be running from Palm Beach to Manly next Sunday.